The Honorable John Willey Willis was elected to the Second District Court in 1892, succeeding the Honorable W.D. Cornish. Born in Saint Paul, Judge Willis attended Macalester College and received his AB from the University of Minnesota before completing an MA at Dartmouth. In 1914, fifteen years after leaving the bench, Judge Willis received a PhD from Saint Johns University. Judge Willis taught Latin and Greek at Saint Paul Central High School in 1878 and was President of Metro Council of Society of Saint Vincent de Paul. 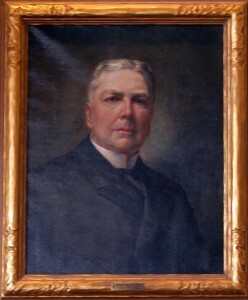 Judge Willish died September 12, 1925 in Washington D.C. while attending a convention for National Catholic Charities. The Law Library has on display judicial portraits of past Second Judicial District Court judges, going back to 1857. If you have any information or commentary about Judge Willis, please leave a response or send us an e-mail. To view the portraits in person, visit us on the 18th floor of the Ramsey County Courthouse. Judge Willis and his wife, Margaret Wharton Fitzgerald Willis, took in my husband’s mother, a child of Italian immigrants living in Swede Hollow, when she was very young – perhaps a baby. The Willis house on Irvine Park still stands – Judge Willis sold it to his Italian court translator at some point according to the book on that neighborhood. The WIllis’ lived in the house Mrs. Willis’ father, Dr. Alfred Wharton, had built at 923 Summit Avenue. My mother in law remembered that her father and his friends spoke Latin and Greek at the dinner table. Judge Willis’ father was a developer who, according Donald Empson’s book, “The Street Where You Live: A Guide to the Place Names of Saint Paul,” platted the area West of West Seventh around St. Clair. Judge Willis was also one of the first non-native residents of Madeline Island and endowed the library in La Pointe. The Willis’ house is still standing and beautifully restored and modernized in the Nebraska Row area of the Island.